After going through an extended depression after losing a close friend, the author of Survive, Live or Thrive? had an aha moment that inspired and propelled her to start writing and creating once again. She is now thriving and feeling revived in many areas of her life, and ironically it all started with a self-help audiobook! Though this self-help book is specifically targeted for women who are experiencing challenges in their lives, the concepts apply to everyone from every walk of life. Fueled by the idea that life is meant to be easy and enjoyable, it is loaded with stories, blog posts and other inspirations to help propel you to the ultimate goal: THRIVING in every area of your life. Survive, Live or Thrive? by L. Lynn Gilliard speaks to you in simple, everyday language about things that you can relate to. Let this little self-help book be the first stepping stone on your road to a more fulfilling and happy life. What made the experience of listening to Survive, Live, or Thrive? the most enjoyable? What I liked about this book was that it has a lot of heart, a great deal of passion and specific purpose of empowering women to take charge of their life and achieve a state of success, happiness and a sense of purpose. The author manages to capture the spirit of determination and the will to thrive in life with vivid imagery, simple yet complex concepts and thought-provoking insights into all areas of life. From relationships (both familial and romantic) to achieving a career that you have always dreamed of, this is the type of book that inspires you to reach farther, think bigger and always strive to be the best you can be. L. Lynn Gilliard has a certain way of writing (and conveying that into the narrative) that is warm and inviting, welcoming you into the book and inviting you to explore the concept of thriving instead of just surviving or living. The audiobook is well-written and skillfully narrated, using a straightforward and down-to-earth style that is easy to understand and easy to apply to your own life. It's insightful and thoughtful, delving into the mysteries of life and just how to take hold of it... getting out of that rut you've found yourself in and truly living a life of passion, success and happiness. Overall, this was well worth my time and provided me with a wealth of insights into my life that have helped me to truly center my thoughts, actions and hopes for the present and the future. I would certainly recommend it to others looking to truly thrive in life with a dose of hometruth from L. Lynn Gilliard. Where does Survive, Live, or Thrive? rank among all the audiobooks you’ve listened to so far? It ranks very high. The audio is great, sound is clear and professional. What was one of the most memorable moments of Survive, Live, or Thrive?? It’s the authors' words that are wonderful, in their reach at opening yourself up, and to really step up to the plate. What does L. Lynn Gilliard bring to the story that you wouldn’t experience if you just read the book? She's very clear, and with a really nice style that pulls you in. And not just with her words, but with her delivery. You feel both empowered, and in control as she guides you through the book. What insight do you think you’ll apply from Survive, Live, or Thrive?? To make a commitment to accountability. I’ve listened to a lot of books narrated by the author and I’m always impressed when I’m listening and wish that I could hear them live and in person. I’m sure this author is wonderful at seminars and live events, and look forward to reading and hearing more from her. Very Inspirational and Motivating: A Must Read! 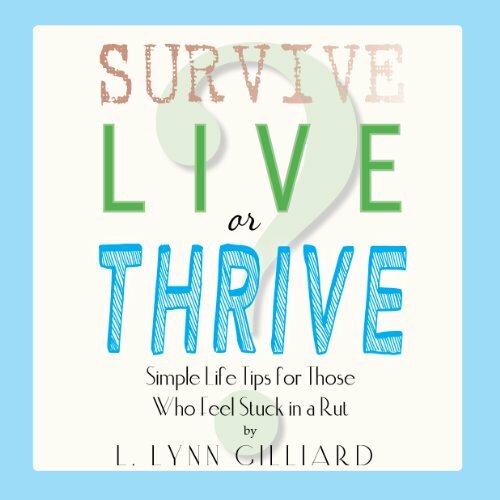 Survive, Live or Thrive is an awesome motivations book that hits home and hits home hard. I listened in bed before I fell asleep, and it touched on so many topics that affect every one of us on a daily basis. From self-esteem issues, not allowing others' opinions derail us from following our dreams, to self-love as being essential for happiness and success. Author, L. Lynn Gilliard goes into great detail when talking about relationships and the importance of what you should, and should not, accept from them in life. In my opinion, this audio book is an essential for anyone who commutes to work, has waiting time, or even to get away from television or video games for a while. This is nourishment for the soul, and is healing, affirming, and lets you know it's ok to be you. I highly recommend to everyone. What other book might you compare Survive, Live, or Thrive? to and why? Sacred Journey to LadyHood. I believe both women hit home on a lot of important topics that affect women and deal directly with self esteem issues and personal success. Have you listened to any of L. Lynn Gilliard’s other performances before? How does this one compare? This audiobook is one that I would listen to many times and I never re-read books or watch movies more than once. That's rare for me. This is timeless and the points in it should be driven home until we get it. Good points made. I did not agree with everything but for the most part the points were made. I think this is a great book for those struggling with confidence and trying to figure things out. Great short and very pleasant listen. Easy to listen to and very inspiring. I will definitely follow this author and narrator. This was my first inspirational audiobook. I was captivated with the story of how L Lynn Gilliard overcame personal life traumas. L. Lynn Gilliard brings the realism of life with the tone of voice provided in the audio recording. I will remember to start everyday with a positive affirmation remembering the blessing of waking each and every day. I found this self help book to be encouraging, by the way the author told of issues/ dilemmas that were traumatic and plaguing from childhood continuing to adulthood. I was inspired by how L. Lynn Gilliard is no longer living life, fueled with negative influences from the past. I most definitely learned from this self help book, to eliminate negative people from my world, even if they are family members. I look forward to the next inspirational installment from this author. Hopefully, the plot it will center on how having a positive outlook, on all aspects in life, provided the author the ability to live happier and make millions. I highly recommend this book for anyone who is looking for a practical self help book. What did you love best about Survive, Live, or Thrive?? As a retired actress one of my fondest memories of being on stage had to be the ten years I spent touring the one woman show Shirley Valentine. The show is about a woman who undergoes a huge epiphany in her life. She decides to leave all behind in order to start over in Greece. I loved doing the show I could tell by the audiences response that it empowered them. People would say “oh that’s a Chick show.” I use to argue “no it’s a people show.” I saw men and women respond emotionally to the show; this book reminds me of that very situation. I decided to spend a solitary day out in the garden going as far into the garden as my leash allows. I had my inhaler, ice tea, panic button and an IPod with this book on it. I turned on the sound more as a distraction, not because, I was sold on the principle. I didn’t give it another thought and went to work. Not expecting much, after a few minutes I found myself really listening to the message of inspiration and hope. That is the day with this book I started rebuilding my life from the inside out. Limited though it may be, at this point it gave me the message I needed. To find within myself the energy and will to rise like the Phoenix I have always been and reinvent myself. Better, stronger and more empowered after the struggle, not that it is going to be easy. The book adopts a tone of acceptance and non-judgment. Oh sure the narrator plays a role in that as well, so well done on the voice over casting. But the readers can only read what the author has written. In that sense there are many powerful messages in this jewel of an audio book. Because of the peaceful production quality you can stay busy with other task and absorb the words more freely. As a retired actress one of my fondest memories of being on stage had to be the ten years I spent touring the one woman show Shirley Valentine. The show is about a woman who undergoes a huge epiphany in her life. She decides to leave all behind in order to start over in Greece. I loved doing the show I could tell by the audiences response that it empowered them. People would say “oh that’s a Chick show.” I use to argue “no it’s a people show.” I saw men and women respond emotionally to the show; this book reminds me of that very situation. Although I’m sure the original intent may have been a female demographic for lack of a better word. This audio book is universal in its empowerment of individual beauty and success. I have been going through one of those uncomfortable growth “things” in life yuck. Nothing I hate more than a growth journey, so painful. That said this book has become somewhat of a bible for me. Many lessons to learn about self with this baby. A life changing health crisis that has left me home bound living life at the end of a fifty foot oxygen leash. It has limited my surroundings and sucked the joy of life from me. So that is where I was in my head when I took a listen. Living at the end of a fifty foot oxygen leash depression has been constant element for the last eight months. But working out in the garden on a beautiful spring day listening to the blog post and inspirational messages created by the author I found myself humming. That’s right I was humming, the dirt smelled good, the sun was warm and penetrating and suddenly my day was a little better. That’s why I’m giving it a five star and a relisten.